Shah Rukh Khan took his ladies -- elder sister Shehnaz and daughter Suhana -- cycling at Mehboob studios in Bandra, a western suburb in Mumbai, on December 6. Shehnaz, who's rarely clicked or seen venturing out of Mannat, SRK's Bandra residence, was dressed in a black top and trousers as she walked along her brother and neice. The trio had ventured out in the afternoon, presumably to take in some fresh air and squeeze in some exercise. 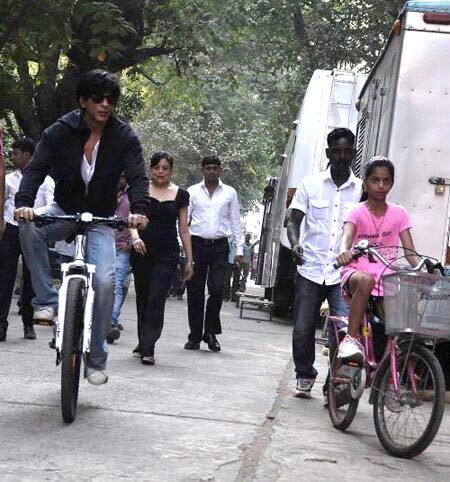 Shah Rukh was kicked about taking his daughter for a cycle ride for the first time. He tweeted before venturing out, "Taking daughter for a cycle ride in bandra...hmmm lets see how it turns out...a first for us." It turned out to be quite a hit with the trio, as SRK's later tweet reveals. He wrote, "One of those days when i go thru the motions. find myself wanting lil pleasures.cycling with suhana was the highlite...need to do it more." Readers Pick: Ten Songs That Became Instant Hits!